Posted on February 4, 2019 by Whole U. This entry was posted in Engaging Interests and tagged dare to do, engaging interests. Bookmark the permalink. 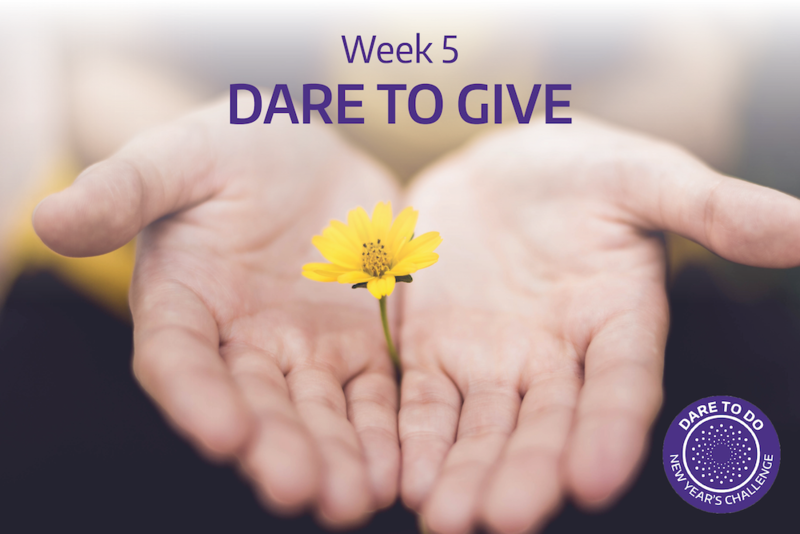 This week, as part of our ongoing Dare to Do challenge, we focus on giving time and service to those in need. There is no surprise that giving back to one’s community and improving the lives of those around us is an important part to the university’s mission. It’s in everything we do at the Whole U, as we aim to bring quality health, wellness, and community building resources to all of you. Daring to Give means being thoughtful about our impact and looking beyond our immediate wants to serve others. To kick-off the week, we’re sharing one of our favorite Whole U articles written by UW CareLink. UW Carelink shares how to navigate supporting colleagues during major life events, providing steps we all can take and how to show empathy. You know a young woman in your department who seemed to have it all — married, good job, one child and a second one on the way. Then you hear that her husband has moved out and they’re headed for a divorce. Or maybe you heard about a colleague who has lost his son unexpectedly, or your manager has been diagnosed with a serious health condition. You want to be helpful, you may even see signs that they are struggling to maintain control of their emotions and focus on their work. What can you do or say that will make a difference? First, remember that each person grieves or processes major life events in their own way based on culture, religious beliefs, family experiences, and traditions. Thanks to these influences and other coping skills, most people will bounce back after the initial shock and instinctively do things to maintain their mental and physical health and be resilient in the face of stress — even major life stress caused by death, divorce, or illness. Shock/Denial: Some people feel numb, and may even experience a sense of denial that the loss has taken place. Release of emotions: Anger, depression/sadness, fear, guilt, hopelessness, remorse, and loneliness. Preoccupation with the loss or the deceased. Guilt/Negative self-evaluation over what should have been or could have been or perceived negligence. Depression: Prolonged feeling of sadness or irritable mood accompanied by sleep, appetite, concentration issues and reduced enjoyment. Withdrawal from social relationships, and re-entrance into social relationships. Personal growth: Individuals will often see themselves as stronger for having successfully gone through the loss. Despite past models of grief that prescribed a pattern of typical responses, there is actually considerable variability. Some people may initially withdraw or seek relief in short-term coping strategies (such as smoking, eating for comfort, and using alcohol, prescriptions medicines, impulse buying etc.). Later they may reach out for support and do those things that support their mental and physical health rather than those that can increase distress and worsen health problems. For others, the pattern may be just the opposite: the isolation and unhealthy forms of coping come later — after there is an initial openness and acceptance of support. Regardless of the process, it takes more time to grieve a major loss than most people anticipate. One of the most helpful things that you can do is to remember that it takes time and to remain available to support your coworker well after the initial days, weeks, or even months. Do not assume based on how they present in the workplace that they are doing okay. Ask the person and be mindful that even then you may not be hearing the whole story. Research on resilience tells us that many factors such as genetics, physical conditions, past experiences and learned coping strategies influence how your co-worker will respond. If you have this knowledge about your colleague/friend, you can be even more sensitive to the kind of support they may need. You may even be able to provide gentle reminders to take care of themselves or avoid the pitfalls of old routines and beliefs. On the other hand, if you do not have a high level of friendship/intimacy, be very mindful of not crossing boundaries as it may result in damaging the relationship, undermining the kind of non-judgmental support that you wish to provide. 2. Don’t make omniscient statements such as, “I know how you feel” “I understand what you’re going through.” It is very difficult, no matter how similar your life circumstances, to know or understand another’s level of suffering. Acknowledging that it is difficult for you to know the depth of their hurting is more realistic and shows that you are aware of their pain. 3. Do act natural, be sensitive, but do not dwell on the loss. 4. Don’t avoid the grieving co-worker. Avoiding may provide a buffer against our own fears and insecurities, but it can be devastating for those needing our support. 5. Do listen. Take time to let them talk about their loss. Talking about it usually helps to resolve the grief. Asking them if they can tell you about it is often appropriate and helpful. Don’t feel like you have to talk to break the silence. 6. Do express your sympathy: “I’m sorry,” “I feel sad for you,” “I care about you,” “I’m thinking of you,” “I don’t know what to say.” Crying with them is okay. 7. Do allow yourself to have your own reactions and to express your feelings. These will most often be interpreted as caring. To experience grief is to acknowledge that you are human. 8. Do use touch when appropriate. A simple hug or hand squeeze can convey a message of caring. 9. Do offer tokens of your sympathy: Flowers, cards, books, and taped music when appropriate. 10. Do understand and foster their need for hope in relation to their state of mind now. 11. Don’t be surprised if the grieving employee “feels the presence” of the one who has died. 12. Do go to the funeral and/or memorial service if invited. 13. Do be patient. Grief work takes time. 14. Do offer to help to lighten the load. 15. Don’t try to impose your meaning for the loss (i.e., God must have needed them more than we did) or make attempts to minimize the pain (e.g., “It’s good that you have other friends/children/relatives,” “Death is part of the cycle of life,” “At least they are no longer suffering,” etc.). 16. Don’t use shoulds and shouldn’ts (e.g., “You should be over it by now,” You shouldn’t cry,” “You shouldn’t keep talking about it,” “You shouldn’t be angry,” — sad, guilty, depressed, feel worthless, and etc.). Help with chores – Relieve the person of some chores such as grocery shopping, doing housework, yard work, etc. Assist with cards and letters – Offer to help write thank-you notes and other correspondence. Lend a hand with meals – Bring something to their home, or extend an invitation for dinner at your home. Answer the telephone – Offer to screen phone calls and take messages. Often another person’s loss touches off our own feelings of grief. You may need to practice your own good self-care by getting adequate rest, good nutrition, exercise, talking to others, and maintaining balance in your life. Mention or remind your co-worker that the UW CareLink program can be an additional source of support to them during this difficult time. Often people forget about resources or have incomplete/inaccurate assumptions about the kind of support they can receive. It can be helpful to remind them of the broad range of support that includes counseling, legal and financial consultation, and assistance with child and eldercare needs. Often major life events have an impact in many of these areas. Through CareLink, faculty and staff can receive referrals to multiple services so that all of their needs can be addressed. To contact the CareLink, call the toll-free number listed below or visit the website for more information and tools. Remember that recovery takes time. Continue your support for as long as it is needed and keep in mind that anniversary dates can be especially difficult. Thank you to AT&T, UW Medicine, BECU, US Bank, UW Recreation, 24hr Fitness, Pure Barre, and Fremont Health Club for being Dare to Do 2019 sponsors! This is all good advice. Grief is different for each person, and each major loss is different…but they do stack up and grief can be “re-triggered.” I think the best thing is to realize this. I have come to this conclusion at 65 and after losing many family members through illness and addiction. Loss is simply complicated…and unknown territory for everyone. I try to reach out to people who are suffering after a death or divorce…but I can make no assumptions about how they really feel. Sometimes people feel simple relief. Formulas do not apply! Sometimes just checking in with them is enough. Thanks for this thoughtful reflection and added advice, Genevieve!